Kvaser USBcan Light 4xHS - MACH SYSTEMS s.r.o. The USBcan Light 4xHS is a compact, reliable and cost-effective means of connecting four high speed CAN buses to a PC or mobile computer. With galvanic isolation as standard, this USB to quad channel CAN interface has a standard USB connector at one end and four high speed CAN channels in a single 26-pin HD D-SUB CAN connector at the other. The supplied HD26-4xDS9 splitter can be used to connect to four separate 9pin DSUB connectors. Low cost USB CAN interface. 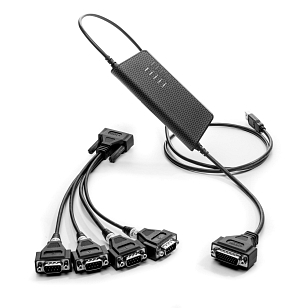 Includes 4 channel breakout cable.